Two women were injured after a hammer-wielding man assaulted them while screaming "Allahu Akbar" in France, according to reports. The attacker, wearing all black, is still on the run, French media reports. The two assaults happened near Place de Beaune in Chalon-sur-Saône, a town an hour north of Lyon, 15 minutes apart. One of the two women is believed to have been hit in the back of the head. The U.S. media will probably not cover this attack. Everyone's attention is focused on the recent London subway bombing. Plus, reporting on this story just might get some folks to see a pattern. Can't have that. All of these attacks are caused by disturbed individuals with no common characteristics, right? Clearly, he was mentally ill. Nothing to see here. How they determined a motive? Muslim terrorists and ANTIFAs are indistinguishable. One and the same. Gee, I wonder what the reason was? Who does such things in a civilized society? Prayers for the victims and families. The attacker probably didn’t like how they were dressed. Being hit in the head with a hammer can cause lifetime or long term problems that get glossed over by the press. How long before the statues of Charles Martel come down? After all, those statues must be very offensive to a certain group of people. Very true. In many cases it’s worse than being shot. Hmmm??? Maybe the women were doing something “offensive”. Thank Goodness for the alert citizen who put them “in their place” in regards to the offensiveness. Phew! If only the women had been allowed to carry. Forgot to add in my previous post to you: You’re probably correct about that. The attacker surely left his house with that hammer. He left with a purpose, to punish any woman not in compliance with the Sharia dress code. 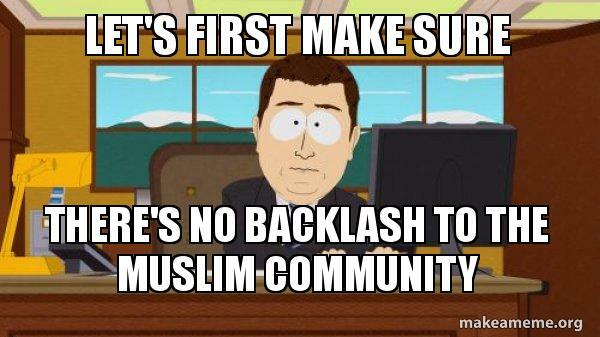 Doesn’t matter if the women were Muslim or not. Compliance is mandatory for all women. It’s sad how the woman’s-rights crowd is so silent about all this. I suppose that a Muslim’s “rights” outrank a woman’s rights. If there was ever a time for a “Women and children hardest hit” story it would be with terrorist attacks. Yes. The liberals are always lecturing about helping women and helping children. But when women and children are actually maimed and murdered, the liberals do not protest. All they do is light candles. Muslms rank at the top of the liberal pecking order. Gee, do police know the motive behind the attack?